At the midpoint of President Obama’s term, there is a widespread perception that he has not lived up to his initial promise. In truth, his record isn’t all that slight, and the passage of health care reform in March 2010 and financial reform in July add substantially to it. The problem lies rather in the high expectations that Obama engendered among the chattering classes and the widespread belief in the incompetence and misdirection of the Bush administration, combined with the sense that Obama isn’t altering things all that much, and the lack of signs that he is broadening, or even sustaining, his base of popular support. Perhaps the most striking aspect of Obama’s performance so far is neither the gestures to the left that many conservatives bemoan, nor the concessions to the middle way that many progressives bewail. Rather, his administration is most notable for its ordinariness: for falling prey to all-too-familiar misjudgments as to political power, policy choices and their consequences, public attitudes and opinion. These missteps are the common lot of American presidents, but were thought to be less likely in this Regime of All the Talents. The unbearable heaviness of governing, it appears, falls with majestic impartiality on whoever occupies the presidency. How do we go about getting a fix on so elusive a president, with so equivocal a record? A president as distinctive as Obama attracts an unusually large flow of analogy with his predecessors. To some degree this feast of comparison has stood in the stead of attempts to define Obama’s presidency in more self-referential terms, as was the case with FDR and LBJ (or, for that matter, Eisenhower, Reagan, and the Bushes). At the same time there has been strikingly little discussion of the meaning and implications of his chosen theme of the New Foundation, in vivid contrast to FDR’s New Deal and LBJ’s Great Society. In the course of 2009 and the first half of 2010, the New York Times and the Washington Post linked “Obama” and “New Foundation” only forty-two times. The Obama administration is most notable for its ordinariness: for falling prey to all-too-familiar misjudgments about political power, policy choices and their consequences, public attitudes and opinion. There seems to be no clear consensus on the character or content of Obama’s presidential leadership or on where he fits in the prevailing classification of America’s chief executives. As Obama’s term progressed, the FDR/Hundred Days analogies thick on the ground in the early months gave way to a different model: not a president taking charge in a time of historic policy change, but a president increasingly burdened by the weight of governance. This progress (or descent) reflects the diminishing expectations attached to the Obama administration. And it makes it highly likely that how Obama will adapt his ambitious Big Government program to widespread public skepticism—and how he will respond to the recent midterm elections—will dominate public discourse for the foreseeable future. By some margin, linkages of Obama with Bill Clinton have been the most frequent in the course of his presidency. This may reflect not much more than the fact that Clinton was the previous Democratic president, and in retrospect is regarded as a successful one; is still (along with his wife) very much in the public eye; and doesn’t overtax the media’s limited historical perspective. There seems to be no clear consensus on the character or content of Obama’s presidential leadership. Analogies with Jimmy Carter are fewer but make more sense. Both Carter and Obama came to the presidency all but out of nowhere: Carter’s two terms in the Georgia Senate and single term as governor were of a piece with Obama’s brief stint in the Illinois Senate and a truncated term in the U.S. Senate. Both ran campaigns that capitalized on widespread distaste for the presidential leadership that preceded them (Nixon-Ford, Bush II). And both spoke appealingly of rising above partisanship and restoring honesty, competence, national unity, and self-confidence to American public life. Carter and Obama began their terms in office with full agendas of issues and programs: the accumulated wish list of post-1960s liberalism in Carter’s case, the agenda of post-1990s liberalism in Obama’s case. (It is notable how much overlap there is: health care, energy, the economy, a new and softer approach in foreign policy.) And both ran into unexpected political turbulence in their first year in office. It is accepted that Carter’s response to adversity was to hunker down: to stick to his policy guns in the face of mounting evidence that they were of diminishing political effectiveness and, in consequence, to consign himself to a one-term presidency. Bill Clinton’s midcourse correction after the disastrous 1994 by-election is a frequently cited alternative model for Obama to follow. His was a classic instance of political adaptability, with a dramatically different political result: a solid second-term victory and considerably higher standing than Carter in the presidential pecking order. No one would claim that Clinton had anything like the large programmatic goals of FDR or LBJ, to which Obama has given considerable rhetorical obeisance. 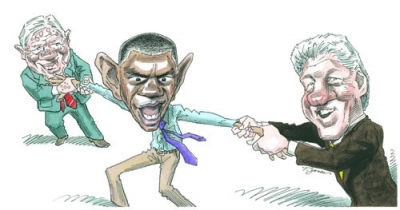 Is Obama capable of echoing Clinton’s striking refusal to be a slave to the hobgoblin of consistency? Or is he more likely to show Carter’s commitment to principle, however politically unpromising? Or—and in the wake of the passage of ObamaCare and financial reform, this has new standing as a possibility—will he persevere but, unlike Carter, retrieve the popularity and élan of his administration’s creation? Less frequent because they are more remote (but perhaps more germane) are linkages of Obama with Woodrow Wilson, the first Democratic president of the twentieth century, and Ronald Reagan, the most transformative Republican chief executive in recent times. Here the model changes: less the enactment of a legislative program, more the articulation of basic political beliefs about government and society. Equations with Reagan are admittedly a stretch. Wilson makes more sense. Obama appears to have a full helping of Wilson’s self-assurance, didacticism, and belief in a moral mission. In late 2007 he set forth a declaration of his larger political goals that can only be described as Wilson-ian: “A nation healed. A world repaired. An America that believes again.” No less evocative was his observation after he became president: “I am well aware of the expectations that accompany my presidency around the world.” Like Obama, Wilson had early domestic policy successes. But the flow of events and the primacy of the president’s role as commander in chief drew him into the role of war leader and would-be architect of world peace: a role that ultimately consumed him personally and politically. Obama has not been reluctant to turn his moralizing style to the tempting if treacherous realm of foreign affairs. This is a path that presidents frustrated by the hazards and ill fortunes of domestic politics are inclined to follow. Think of FDR and World War II, LBJ and Vietnam, George W. Bush and the war on terror. But comparisons with predecessors, however illuminating, go only so far in casting light on the causes of presidential policies. It is necessary as well to see Obama’s actions in the context of the larger political culture to which he belongs. Why is a president of whom so much was expected, and who came into office with the most favorable legislative and media environments in decades, not doing better? Obama’s communication skills and intelligence understandably continue to be admired by most of the chattering classes and much of the public (although a shrinking share). And the scope of his ambition to oversee systemic change—in the economy, health care, energy policy, education, and foreign policy—remains undimmed in the face of the battering his agenda has undergone in the course of its first year and more. Much of this seems inevitable in retrospect, and is by no means Obama’s fault. It is no small matter to satisfy a constituency that ranges from volatile college students and affluent members of the liberal left to African-Americans and skeptical centrists. The question remains: how will Obama adapt to the altered, decreasingly sympathetic political atmosphere that surrounds him? Even FDR, in the far more attention-focusing circumstances of the Great Depression, had to make major course corrections in policy. He soon distinguished between the immediate need to do something—anything—to relieve the most searing immediate consequences of the Depression and the longer-term social and economic policy changes that recovery and reform appeared to require. This is a distinction that Obama has not so far chosen to make. But then, he is confronted by a far less malign national condition. Obama appears to have a full helping of Woodrow Wilson’s selfassurance, didacticism, and belief in a moral mission. Lyndon Johnson, second to none in his mastery of the machinery of American government, ran aground on Vietnam and the negative effects of the Great Society—less than four years after he won one of the great electoral victories in American history. Obama has not yet had to deal with so consequential a foreign policy setback. But there are signs of a similar disconnect between the strongly social-democratic thrust of his domestic initiatives and the predominant mindset of the American people: a potential replay of the reaction against Johnson’s War on Poverty. Yet Obama remains one of the most interesting, intelligent, and original politicians of recent times. It is proper to conclude that his difficulties stem from the larger political milieu as much as from personal mistakes and drawbacks. The origins of the political culture in which he has to make his way lie in the New Deal years of the 1930s. But it assumed its current form from the 1960s on. Its most notable features are the decline of political parties as prime dispensers of patronage and power, and the rise of polarized groups on the tails of the political-opinion bell curve. Of ever-increasing importance is an “independent” middle, susceptible to the siren call of either party depending on the social-economic or foreign policy situation and political mood of the time. Campaigning toward the center and then governing from the ideological edge has been typical of recent presidents. That was the case with Bill Clinton before his sobering 1994 congressional election experience. It was also the case with George W. Bush before his 2006 midterm election setback. How will Barack Obama respond to the 2010 congressional elections? Gilbert and Sullivan’s observation in Iolanthe that “every boy and every gal/That’s born into this world alive/Is either a little Liberal/Or else a little Conservative” needs a second look. For some years now, self-described independents have been at least equal to and often more numerous than self-described Democrats or Republicans. The role of independents in the elections of 2006, 2008, and beyond is widely held to have been decisive. The will-o’-the-wisp of a permanent party majority continues to lure political pundits and gurus. But the electoral and cultural basis for that scenario is weak. The more accurate contemporary template is of an electorate with partisan and ideologically committed bell curve tails, and a substantial, growing, and politically determinant middle that is inclined to vote on the basis of the candidate and/or the issues more than the party. What about that other distinctive new feature on the political scene: vocal and well-financed special interests? Ideologically minded advocacy groups are widely regarded as the most conspicuous new force in American politics. Their political action committees and so-called 527 organizations reached a peak in money spent and attention garnered in the 2004 election. But the 2008 contest, and political developments since, highlight the volatility of contemporary American political culture. Left-wing fat cats such as George Soros and politically ambitious bloggers such as Markos Moulitsas and his Daily Kos, and Arianna Huffington and her Huffington Post, turned out to be flash-in-the-pan influences. In this (as in much else) they resemble counterparts in the evangelical-fundamentalist religious right or conservative-populist talk show hosts Rush Limbaugh and Glenn Beck. All attract followings ample enough to pad their egos and their wallets, but hardly enough to control the political process. The inability of the GOP right to block the nomination of Senator John McCain, and the predominance in 2008 of Obama’s own fundraising and support-getting operation over the advocacy groups, the blogosphere, the 527s, and organized labor, are evidence that the reach and staying power of fringes right and left have been exaggerated. The rise of Obama demonstrates the continuing capacity of our mainstream political system to reinvent itself. But it is subject to the iron law of diminishing returns. His 13 million or so online supporters have not as yet been successfully mobilized to be a force for his legislative program, as they were for his election. Instead, the most notable (and least expected) turn of the political wheel has been the rise of the anti-big-government tea party movement, which has echoes of the Ross Perot episode of 1992. But the tea party has not yet demonstrated the staying power to be a significant force in the 2012 election. The bottom line appears to be that interest/advocacy group politics and populist political outbursts such as the rise of the Obama coalition in 2008 and the tea party in 2009–10 are likely to be as transient and ephemeral as those widely touted previous game-changers the PACs, the 527s, the right-wing talk show hosts, and the left-wing blogosphere. One way of making sense of this new political culture is to see it as shaped by an ongoing struggle between its major components. One of these is a two-party system ordained and legitimized by the Constitution—in effect, the only way we have of doing our political business. The other is the more variable political style generated by changing technology and a vast, mobile population subject to new demographic and social-economic conditions. Finally, what about the media, whose political presence includes not only the press and television but those explosive new players the Internet and the blogosphere? The Democratic-liberal inclination of the mainstream print and TV media is one of the more notable features of late twentieth- and early twenty-first-century political discourse. While media ownership shifted from opinionated (and usually right-wing) press barons to grayer corporate suits, reporters got to be more highly educated, more engaged and adversarial in their reporting, and more likely to be left-liberal in their social and political outlook. This did not occur in a cultural vacuum. It was linked to, and bolstered by, a similar shift in the makeup and outlook of colleges and universities, foundations, and other culture-definers. The will-o’-the-wisp of a permanent party majority continues to lure political pundits and gurus. In life as in physics, every action has a reaction. The left-liberal tone of the mainstream media and likeminded websites and blogs was not likely to flourish unchallenged in a predominantly centrist-conservative nation. Talk radio was a cheap and widely accessible outlet for the rise of a conservative counter-voice. So too were the Internet and the blogosphere. Liberal-leaning CNN capitalized on the rise of cable TV, but it was soon confronted, and eventually outgunned, by conservative-leaning Fox News. Meanwhile, the mainstream media—big city newspapers, the national news magazines, the three national television networks—eroded financially under the competitive pressure of cable TV and the Internet. From 2001 to 2008, newspapers as people’s major source of news declined from 50 percent of the population to 35 percent. Television slid from 82 percent to 70 percent, while the Internet rose from 13 percent to 40 percent. The shrinking newspaper and TV news-viewing habits of 18–29-year-olds suggests that this will be a continuing fact of American public life. But just as the major parties are able to retain their dominance over American politics (indeed, third parties are at a historic low), so the demise of the traditional media has been prematurely assumed. Television and the movies retain much of their popularity in the face of newer technologies. And it is not at all clear that supposed culture-changers like Facebook are about to transform the form and substance of American politics. An awful lot of old wine—what leads people to their political allegiances, the persistent need and hunger for news about the world outside, the continuing capacity of the parties to respond to the political needs of most people—sloshes around in the shiny new wineskins of the Internet age. Interest/advocacy group politics and populist outbursts—tea partiers included—are likely to be as transient and ephemeral as earlier, equally touted game-changers. It is in this new political world that Obama brilliantly made his way to the presidency. And it is in this world that he must deal with the ideological, policy, and political realities that make governing so heavy a weight to bear. Excerpted from The Unbearable Heaviness of Governing: The Obama Administration in Historical Perspective, by Morton Keller (Hoover Institution Press, 2010). © 2010 The Board of Trustees of the Leland Stanford Junior University. All rights reserved. New from the Hoover Press is The Unbearable Heaviness of Governing: The Obama Administration in Historical Perspective, by Morton Keller. To order, call 800.935.2882 or visit www.hooverpress.org.